What Is Hiking vs. Walking Off-Road? Is Hiking More Than Just Walking Off-Road? The line between hiking and walking is blurry once you step off the pavement. While both activities are exploring on foot, many people identify themselves as only a hiker or only a walker. See the differences between these two activities and what they have in common. There are many elements that people use to judge whether they are hiking or simply walking. Hikers hike on natural trails, while walkers walk on any surface—concrete, asphalt, gravel, or sand. Hikers seek natural environments—forests, mountains, parks. Walkers walk anywhere. Hikers like to dress the part in natural fibers, sturdy hiking boots, and a hiking stick or trekking poles. Walkers may look like anybody else out strolling down the street. Hikers take the 10 essentials along to deal with any emergency, including a compass and a way to make fire, and often carry these items in a backpack. Walkers take their house key (when they remember), cell phone, identification, money or a card, and maybe a water bottle. A walker might carry a purse or pack or just make use of pockets. Hiking is rated as burning more calories per mile than walking at the same speed, due to hills and uneven surfaces. Most walkers are willing to cross over to the wild side to spice up their walking. If they live near a natural area, they are likely to enjoy walking there at least once in awhile. Some walkers do not want to walk uphill or on trails where there are rocks and roots. People used to walking on pavement would need to gear up properly for a hike. 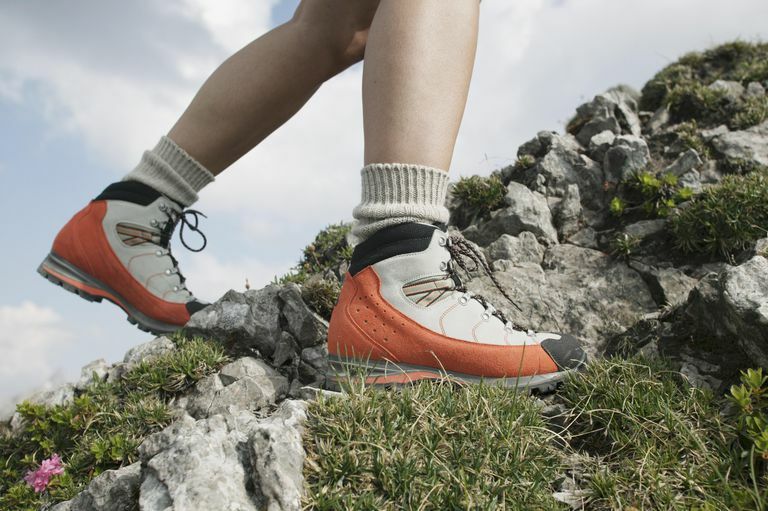 There are good reasons to wear trail shoes for hiking rather than wearing typical athletic shoes. Trail shoes protect the feet and provide stability and traction. A hiking stick or trekking poles provide extra stability on rough trails. However, many hikers turn up their noses over the idea of going for a nice long walk that isn't in the woods. They don't want to walk in urban area, suburbs, city parks, or even along country roads. They want a completely natural setting. In general, people who walk for fitness walk two or more days a week. But many hikers only hike occasionally, and only in season. Is this quality over quantity? Researchers have found mental health and stress relief benefits for walking in a park or other natural setting. If your usual exercise is done in a gym or on the treadmill, think about enjoying at least short walks in local parks. A hiker would have to change up their gear for walking on sidewalks and paved paths. Flexible athletic walking or running shoes are best for paved surfaces. Sweat-wicking clothing works better than natural fibers to keep a walker dry and cool. And they can leave the trekking poles at home or use fitness walking poles instead for an extra workout. Things to be aware of when you learn to hike besides the right gear include the concept of leaving no trace. If you pack it in, pack it out. Children should be taught to be respectful of the natural environment and stay on the trail. You will probably need to carry your own water and know how to properly handle restroom needs when there are no toilets. If you rarely walk or hike, or you only walk on flat, paved surfaces, it is wise to do some training before you go for a long hike or trek. Training to walk hills at high altitude has two goals. First, you must build your aerobic fitness in general by doing workouts that get you breathing hard and sustaining that effort for increasing amounts of time. You also must work on getting some hill workouts or increasing the incline on your treadmill so your muscles are ready. Trekking means that your hike or walk takes two or more days and you will be carrying your gear along with you in a backpack. You will need training that includes training with your gear. Walking the Camino de Santiago is an example of a trek. Although this pilgrim route is called a walk, much of the time you are going up and down steep hills on natural surfaces. Each year, the first Saturday of June in the U.S. is National Trails Day. It is a day set aside to get outside, enjoy a trail, and be a hiker, biker, or rider for the day. A trail may be in a local park, a national forest, a national park. Hikers and walkers have much in common. Certainly, all hikers are also walkers, whether they identify themselves as that or not. Meanwhile, walkers can benefit by getting out into green spaces, getting a little dirt on their shoes, and seeing more of the beauty of nature. Bratman GN, Hamilton JP, Hahn KS, Daily GC, Gross JJ. Nature Experience Reduces Rumination and Subgenual Prefrontal Cortex Activation. Proceedings of the National Academy of Sciences of the United States of America. 2015;112(28):8567-8572. doi:10.1073/pnas.1510459112. Song C, Ikei H, Miyazaki Y. Physiological Effects of Nature Therapy: A Review of the Research in Japan. Tchounwou PB, ed. International Journal of Environmental Research and Public Health. 2016;13(8):781. doi:10.3390/ijerph13080781.